I am once again humbled by the generous, amazing, kind and just overall awesome people I am lucky enough to call my friends and family. As I mentioned in the previous post, I have been preparing for an art showcase for a little over a month. It went down this past Friday at the Yost Theater in Santa Ana. The turnout was amazing to say the least, but the outpouring of love and support from everyone has me floored. I'm not a very outgoing person. Surprising, I know. ;) And I'm not very outspoken either, but I've been wanting to make good on my 2015 resolution to be brave, and I think I was able to accomplish that a little bit here. This show was a first for me, and it was a wonderful experience. It was nerve-wracking, exciting, challenging, and definitely pushed some of my limits. 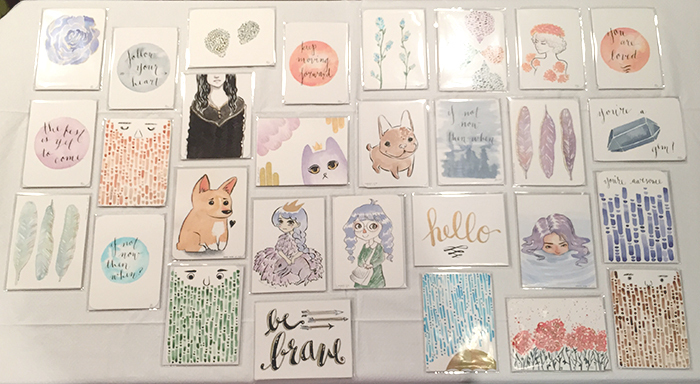 I was able to show my work, gathered my courage and talked about myself (yikes!) and talked about my art (double-yikes! ), and even sell a bunch of mini originals and prints. I haven't been this happy about my art in a long time and it's pretty damn good feeling. Original MINIS - Watercolor and inks. I tend to internalize a lot of things... I'm an introvert through and through. But I think little by little, if I'm able to show and share my work with more people, it will get a little bit easier to show more of what makes me tick. I'm going to ride out this high as far as I can, and with the rock solid support system of my friends and family, I know I can take it far far far faaaar into the future. 2015 has only just begun, but I can't wait to see where it takes me. Just a quickie post to say that I've (finally) added my Firefly pieces to the art section of my site. I've been itching to do some spring cleaning and move things around, so keep an eye out for those changes. In other news... I'll be participating in another group show at A Little Known Shop in October!! :) Stay tuned for details! My dog is SOOO EXCITED!! My OOTD (that's outfit of the day...). Except I'm not cool enough to be a fashion blogger... So you get a derpy sketch instead. I am in need of so much sleep right now. Good night moon!